Hands are precious, irreplaceable tools that we use in almost everything we do. As a result, they may also be exposed to a whole range of risks that often require a specific approach in terms of safety. However, not every protective glove is the same. The challenge is to select the most appropriate glove for the intended task or situation and to use it in the proper way. Under European Directive 89/656/EEC, employers in the European Union have the duty to carry out a risk assessment and reduce, isolate or eliminate any risks or hazards as much as possible. If it is not possible to eliminate the risk completely (i.e. if, despite all precautions, there is still some residual hazard), the correct and appropriate Personal Protective Equipment (PPE) must always be selected and worn. When risks to hands are involved, this means selecting and wearing the appropriate protective gloves. If the risks in the workplace should alter in any way, for instance by the introduction of a new industrial process, the assessment regarding the appropriate glove for the job needs to be reviewed. In non-European Union countries, however, this legislation does not apply. It’s a fact: there is no ideal universal protective glove that will always provide protection for hands from every possible risk. Making the right choice of gloves, including the materials they are made from, is extremely difficult and can sometimes be very complex. Because there is such a wide variety of situations and different circumstances regarding exposure to risk, choosing the right protective glove may be a unique process for every individual situation. Exposure to any residual hazards therefore needs to be assessed before selecting the most suitable protective glove for the job. • Other factors: cost, possible allergic reactions, can the gloves be laundered and/or recycled? Gloves should be constructed to make the best possible use of the protective properties of the material used, and to impede the wearer as little as possible. and without style, the wearer will feel less inclined to wear the glove correctly. Protective gloves should allow the wearer to feel comfortable and unrestricted as far as is practicable. Depending on the design and the different materials used in the construction of the glove, different protection and use features will apply. Protective gloves for cut-resistant applications are usually manufactured from specific technical, cut-resistant yarns such as aramid fibres (e.g. Kevlar®, Twaron®, etc. ), high-performance PE yarns (e.g. Spectra®, Dyneema®, etc. ), as well as yarns containing metal fibres, such as stainless steel, or even mixtures of these yarns or gloves made from chain mail. These are cut-resistant gloves usually constructed from metal rings. Knitted gloves may also be coated or dotted with a polymeric material (e.g. natural rubber, nitrile rubber, neoprene, PVC, etc.) to provide a better grip or repel liquid, or include an outer layer of another material, such as leather, to improve resistance to abrasion or puncture. Gloves that protect against chainsaw cuts are usually made from layers consisting of leather or coated materials. This type of glove needs to include a protective layer inside the glove back, inserted under the outer fabric to provide protection against cuts from a chainsaw. Protective gloves for abrasion-resistant applications are usually manufactured from high-quality leather or from fabric-coated gloves. Each of these coatings (e.g. nitrile rubber, natural rubber, neoprene, polyurethane, PVC, etc.) may behave differently in different applications and needs to be chosen very carefully, depending on the application involved. Nitrile rubber usually provides very good resistance to abrasion, cuts and punctures, as well as an excellent dry grip and outstanding oil and grease resistance/repellence. Natural rubber is selected in particular when very good hand dexterity and glove elasticity is required. The downside of natural rubber is that it contains proteins that may cause allergies to sensitive skin. Neoprene provides good physical properties and specifically highly resistant to acids. Polyurethane provides outstanding abrasion resistance, combined with good hand dexterity. And PVC, or polyvinylchloride, is particularly good for its abrasion resistance and usually provides excellent grip in wet applications. Protective gloves for puncture-resistant applications may include heavy-duty leather or metal elements, such as metal plates, inside the glove. It must, however, be noted that puncture-resistant gloves are not always designed for protection against syringes and needle-stick injuries. If protection from syringes is required, a glove containing small metal plates would be most appropriate. The European PPE Directive 89/686/EEC specifies two classes of gloves to meet two levels of risk: ‘minimal’, and ‘mortal’ or ‘irreversible’ risk. Any risk that falls between these two levels may be described as ‘intermediate’. To comply with the PPE Directive, you need to establish the level of risk and select gloves of the appropriate category. Gloves of simple design - for minimal risk only. For gloves of simple design that offer protection from low-level risks, e.g. janitorial gloves, manufacturers are permitted to test and certify the gloves themselves. Gloves of intermediate design - for intermediate risk. Gloves designed to protect against intermediate risk, such as general handling gloves, requiring good cut and puncture performance, must undergo independent testing and certification by a Notified Body. Only Notified Bodies are permitted to issue a CE mark, without which the gloves may not be sold. Gloves designed to protect against the highest levels of risk, such as chemicals, must also be tested and certified by a Notified Body. In addition, a quality assurance or quality control system used by the manufacturer to guarantee both homogeneity of production and homogeneity of the product, must be independently checked. The Notified Body carrying out this evaluation is identified by a 4-digit number that must appear alongside the CE mark. Because gloves offer the first line of defence when hand protection is required, the materials used should also be tested for resistance to the relevant mechanical risks. Each of the standards is usually based on tests performed under standard laboratory conditions that may or may not reflect actual conditions of use. As a result, standards are voluntary and provide advisory data designed only to assist users in selecting gloves and defining their limitations, but not the service life of the glove itself. In the European Union, EN standards have been established. These standards translate the intent of the European PPE Directive into specific working documents and testing methods. They therefore provide a presumption of compliance with EU legislation. EN standards were initially developed back in the early 1990s, first appearing in 1994. They are subject to regular revisions. This work is the remit of the Committee for European Normalisation (CEN), TC162-WG8, which is made up mainly of representatives from the various national standards organisations and Notified Bodies, as well as major European glove manufacturers and distributors. In addition to EN standards, American ASTM or International ISO standards also exist. The main used standard for mechanical protective gloves is the EN 388 standard. This standard applies to all types of protective gloves in respect of mechanical injuries caused by abrasion, blade cut, puncture and tearing. Under this standard, the properties of these gloves are marked on the gloves and shown by a ‘hammer’ pictogram accompanied by a 4 digit figure – digit 1 refers to the resistance to abrasion, digit 2 is the resistance to blade cuts, digit 3 is the resistance to tearing and digit 4 is the resistance to puncturing. The higher the figure, the better the glove will protect against the particular type of risk. Based on the number of cycles required to abrade through the sample glove (i.e. when a hole is worn through the test specimen), using a standard sandpaper under a known pressure of 9 kPa. A similar test method for measuring the abrasion resistance of gloves is the ASTM D 3389. This test also measures the number of cycles required to abrade through the glove specimen, but this time using 2 vertically-oriented abrading wheels under a vertical load of 500 or 1000 grams. Based on the number of cycles required to cut through the sample, using a standard circular blade under a load of 5 N at a constant speed. The calculated index factor, to determine the performance level of the glove, is based on the number of rotations needed to cut through a reference material and through the test specimen. For highly cut-resistant materials, this standardised test method may sometimes produce unreliable results. As a result, the use of an alternative test method under ISO 13997 is currently being investigated and will be introduced to the EN 388 standard once validated. This ISO 13997 standard measures the load required to cut through the glove sample after a 20 mm blade displacement. ISO 13997 is exactly the same as the ASTM F1790:2005 standard. Based on the amount of force required to tear the sample. The test measures the highest peak recorded to tear a pre-cut (500 mm incision) test specimen at a specified tear speed. Based on the amount of force required to pierce the sample with a standard sized point. For mechanically-resistant gloves, the EN performance levels for abrasion, cut, tear and puncture must be prominently displayed alongside the pictogram on the gloves, as well as on the immediate packaging containing the gloves. For gloves designed to protect against chainsaw cuts, EN 381-4 (= test method) and EN 381-7 (= requirements) apply. Under this standard, the entire back of the left-hand glove needs to provide protection from the chainsaw, including the back of each finger, except for the thumb. Additional chainsaw protection outside this required area may also be offered. The right-hand glove does not need protective coverage but, if protection is offered, it must at least cover the entire back of the metacarpus. The gloves are put on an artificial hand and submitted to cutting with a chainsaw, using a force of 15 ± 0.5 N. Glove cuts are made in various positions and different chain speeds are applied: 20, 24 and 28 m/s; class 1 corresponds to 20 m/s, class 2 = 24 m/s and class 3 = 28 m/s. For gloves offering protection against cuts and stabs by handheld knives, the protective features are evaluated according to EN 1082-1 (for chainmail gloves) and EN 1082-2 (for gloves made from materials other than chainmail) standards. Protective gloves are tested for impact cut resistance, which is based on the resistance to penetration of the glove material, using a standardised knife, which is allowed to fall on the test specimen with a preset level of energy. For chainmail gloves, this penetration should not exceed 17 mm anywhere in the glove specimen, with a mean value not to exceed 10 mm. For gloves made from other materials, penetration should not exceed 14 mm anywhere in the glove specimen, with a mean value not to exceed 8 mm. Also for these gloves, the cut resistance under ISO 13997 should be at least 20 N.
For any of the EN standards mentioned above, compliance with EN 420 is also a requirement. If a glove is not of a length specified above, the manufacturer must state clearly that the glove is for a special-purpose application. Dexterity: gloves can optionally be tested and rated for dexterity. This is based on the smallest diameter of pin that can be picked up three times within 30 seconds. Marking & information: each protective glove has to be marked with the name of the manufacturer or authorised representative, the glove designation, size, CE mark and relevant pictogram (+ where relevant, the accompanying performance levels) and the CE mark. The outer packaging must be marked with the same information that is mentioned on the gloves, as well as with the address of the manufacturer or representative, and if protection is limited to part of the hand, this also must be mentioned. Each commercial pack must contain an Instructions leaflet specifying applications and limitations of use, the available size range and recommended cleaning and care methods, as well as the conditions required for storing the gloves. It must be noted that this Instructions leaflet is a very important information sheet that should always be read carefully prior to using the gloves. All of the manufacturer’s recommendations must also be followed strictly when using the product. A market study conducted by Ansell in 2008 found that > 50% of glove users did not know why they were wearing the gloves they were using. Consequently, employees at all levels should be made fully aware of all safety procedures, including the reasons they are applied, and the role played by wearing appropriate protective gloves. Users must also be encouraged to observe and enforce these procedures strictly. Workers must be fully trained in the use of protective gloves and, depending on the size and nature of the organisation, training should be arranged by a competent person for all relevant staff. Preferably, this training should also be updated by periodic refresher courses. Each glove and accompanying packaging or leaflets must be properly identified to avoid the inadvertent or accidental use of the wrong gloves for unsuitable tasks. The proper storage of gloves is essential to maintaining their integrity and effectiveness. Specific individuals should be assigned responsibility for glove storage, with adequate space provided in a dry, well-ventilated room maintained at a moderate temperature. Protective gloves should be stored away from bright sunlight and from any equipment likely to produce ultraviolet radiation or ozone that might cause them to decay or otherwise become damaged. Gloves should always be inspected when they are issued, as well as before and after use. A competent person or the user should check that the gloves are correctly identified prior to use and that there are no signs of damage or excessive contamination. Where workers are entering a highly dangerous environment, it may be necessary to provide assistance in inspecting the gloves. When they are removed, contaminated gloves should be placed in clearly designated areas for cleaning so that the gloves cannot be re-used and the possibility of the wearer being contaminated is minimised. 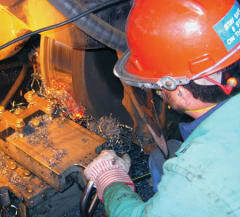 Gloves have an important role to play in providing proper protection in the workplace. Sound procedures must be put in place for selecting the correct gloves to use and users should be fully trained and instructed about the gloves they are using. The choice of the appropriate protective glove is extremely important, because inappropriate glove materials can cause serious skin and health problems (short-term or long-term) to glove users. 3. European Committee for Standardization (CEN). Protective gloves against mechanical risks (Standard No. EN 388). 4. European Committee for Standardization (CEN). General requirements for Protective gloves (Standard No. EN 420).